Overview: Unknown to most of mankind, there is a hidden land living beneath the surface of our planet. From an opening near the North Pole, visitors can travel to the wilds of Skartaris, a deadly world where magic and science co-exist. The fighter jet flown by Air Force pilot Travis Morgan crashes through the opening into a new world. With limited supplies, Morgan must embrace his new reality and rely on his skills to survive this unforgiving land. This is Showcase Presents The Warlord Vol. 1. Travis Morgan quickly develops a friendship with Machiste and a romantic relationship with Tara, a princess from the land of Shamballah. Travis will need all the help he can get from his friends, as he quickly develops a mortal enemy, the evil Deimos. Outside of a quick return to the surface world, where he recruited Mariah Romanova to join his adventure, Morgan makes Skartaris his home. Because time flows at different speeds in this land that never sleeps, Morgan returns to Skartaris to find Tara has given birth to their son, Joshua Morgan. Unfortunately, with a enemy like Deimos, no one is safe. Young Joshua is kidnapped, driving a wedge between Travis and Tara. Deimos creates a duplicate of Joshua, and ages the copy to adulthood. Controlled by Deimos, the duplicate is sent to fight Morgan, who believes he is fighting his own son. In a battle to the death, Morgan survives, but is heartbroken over the apparent demise of his son. Deimos is killed as well, but everyone knows that no good villain goes away that easily. This volume ends with Morgan traveling through the wilds of Skartaris, seeking adventure and trying to heal his broken heart. Tara has gone her own way, unable to be with the man that killed her son. And baby Joshua is still alive, and being raised by adoptive parents. Who says everything has a happy ending? Why should these stories be Showcased? : The sword and sorcery books, such as Conan or The Warlord, have never really appealed to me in the past. So it was a big surprise with how much I liked this collection. Grell developed a story formula that worked well for this book – 17-page stories, with pages 2 and 3 as a double-page spread. In this magical world, anything was possible to tell – battles in the mountains or at sea or in a jungle. By the time I finished this volume, I was wishing DC had a second volume available. This title may be one that I seek out the back issues to continue the story. Footnotes: The Warlord #11 reprints the origin story from 1st Issue Special #8. The cover to issue #11 is included in this volume. If you like this volume, try: Jon Sable, Freelance from First Comics in the 1980s. Grell has stated that Sable was a mix of James Bond and Mike Hammer, an Olympic athlete and big-game hunter who now works as a private investigator. Grell has revisited this creator-owned character from time to time with other publishers. Sable was popular enough to be developed into a short-lived television series. Beginning in 2010, IDW began issuing Jon Sable, Freelance into Omnibus editions, collecting the first 33 issues of the series across two volumes. 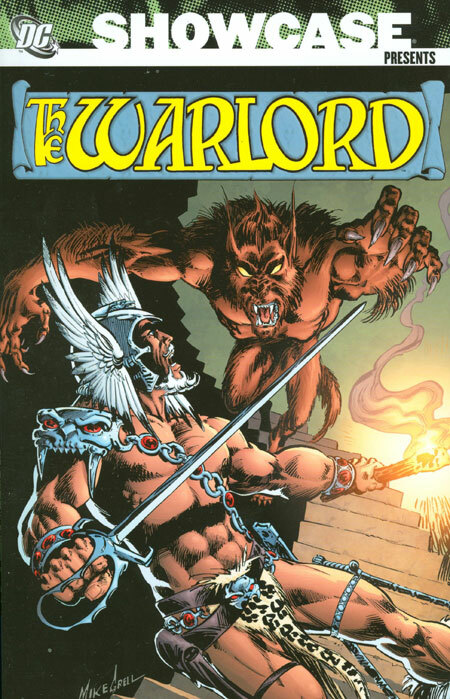 This entry was posted in DC Showcase Presents, Warlord and tagged Mike Grell, Warlord. Bookmark the permalink.